I still haven't seen a baked potato or rope in my world, so I'm uploading a few sketchbook pages instead of catching up with EDM challenges. 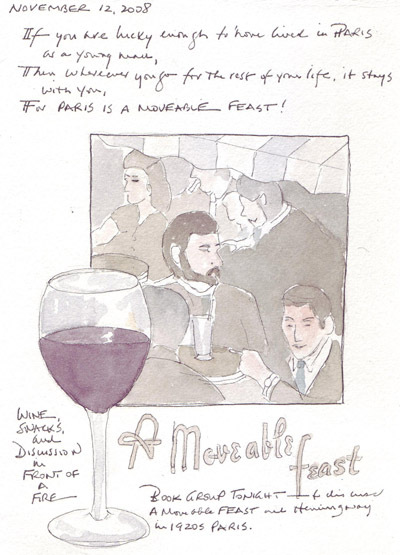 Our Book Group read Moveable Feast - and I found my old copy which I read in 1988. The wine glass is for the amount consumed by Hemingway and his friends in the "Lost Generation" and the wine that I drank during our discussion. I crawled into bed at 10:45 and still wanted to fill a journal page - so my rocker next to the bed became my focus. After a full day with my two 3 year old grandchildren, I sat quietly in my usual evening seat and painted the view in the room that I love. 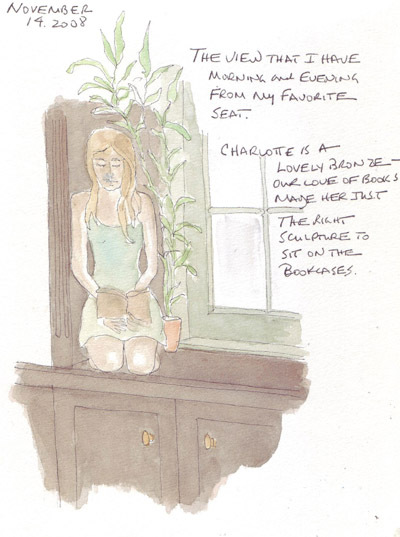 During the year that my daughter and her family lived in London, my husband and I decided to combine all Christmas, birthday, and anniversary presents to each other and bring home this lovely sculpture of a young woman reading a book. She remains very precious to me. On Saturday, we took our oldest grandchild, now 5 1/2, to the Museum of Modern Art and he was thrilled and mesmerized by the children's audio that they have for multiple paintings. Here he is with the audioguide to his ear, listening multiple times to the wonderful information and music provided directly at his level. He first learned about Picasso's Three Musicians from the children's program "Little Einsteins." Also favorites that afternoon were paintings by Matisse, Chagall, and especially Rousseau's Dream. I still try to draw and paint several figures and faces each month. These are 3 of my journal pages from November. My 3 year old grandchildren walking through Central Park. They were running most of the time and I had trouble even getting a picture. I'm always thrilled when I can draw a figure with a face. This was drawn from a photo in a magazine. My friend sent me a book of Delacroix's pastels and this drawing was inspired by his pastel entitled Seated Arab in Striped Burnouse. 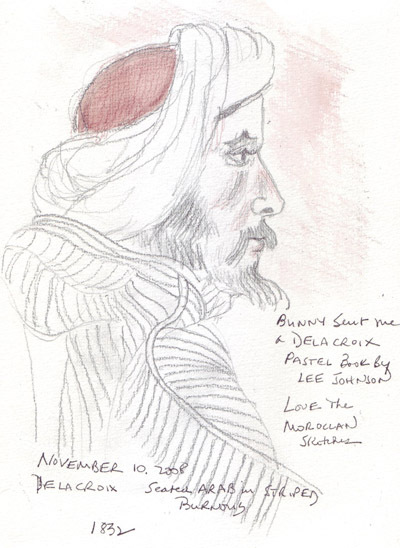 I'm now inspired to search for Delacroix's Moroccan sketchbook. 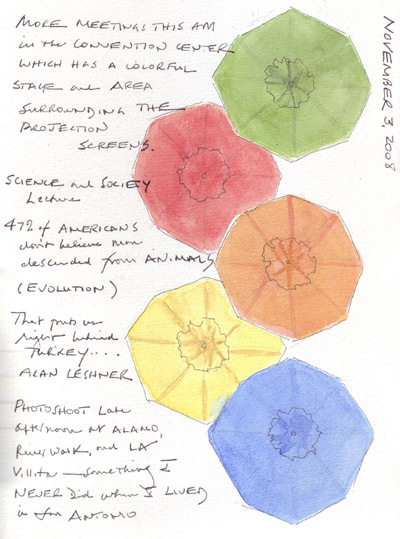 I intended to upload these journal pages from the second part of my recent Texas trip much earlier, but life got in the way. The election results (which pleased me), full days at work and busy evenings all intervened. So I'm eating lunch and uploading 3 pages at work so I don't fall further behind on my self-imposed schedule. 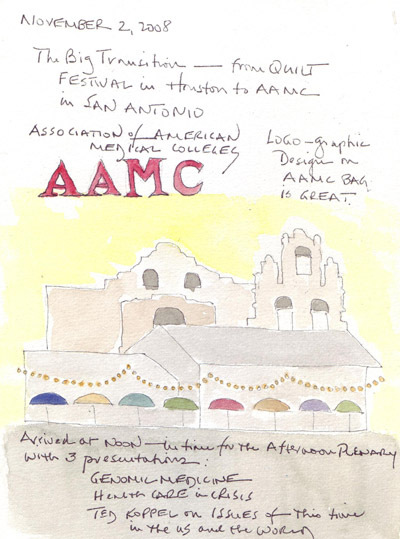 I went to San Antonio for a work-related meeting and loved the logo on the bags that were given to us with all of the conference materials. We lived in San Antonio for 18 years and the design was very specific for the city. The colors of San Antonio are very bright, reflecting the Mexican culture, dancers, and mariachis. The stage in the Convention Center was decorated with these sun umbrellas - that dot the restaurants along the Riverwalk - and I knew immediately that I was back in town. One person was sitting at a table in the front of the meeting room on my last day and I was able to both draw and paint her without any comments being made by those sitting at my table. I began to attend the annual International Quilt Festival (in Houston) when I lived in Texas and continued this yearly pilgrimage after I moved to New York City. This was my 24th year and it was as informational and inspirational as ever. A wonderful old friend accompanied me making the 4 days even better. 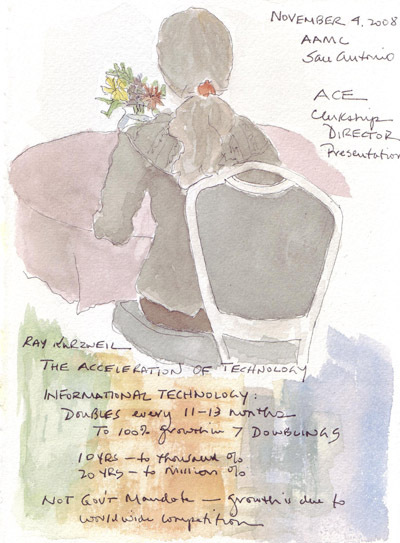 I took classes, went to lectures, and wandered the entire convention center surveying new products and exceptional textile art. It was hard to spend a few minutes completing my daily sketch before bed at night, but I tried to make the pages a visual journal of my important daily activities. 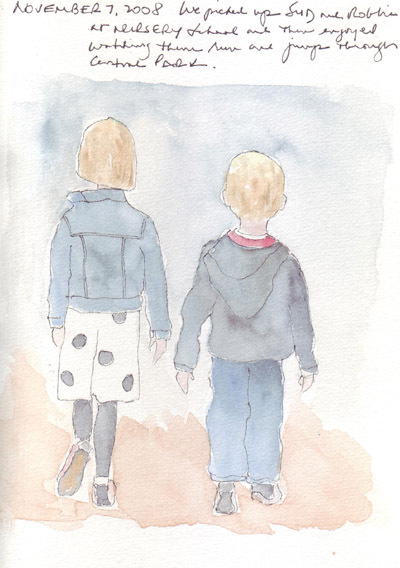 I used the sketchbook that I bound with Fabriano Artistico soft press 140 lb watercolor paper for the first time. 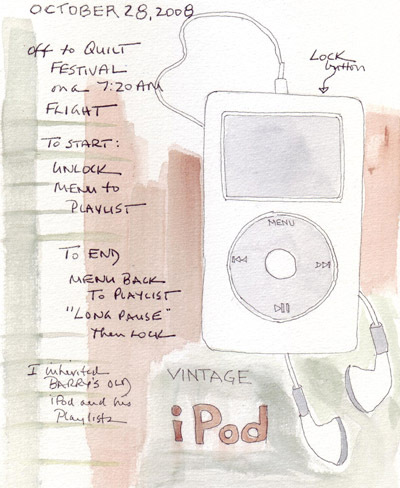 I inherited my husbands old iPod (and playlist) and took it with me to listen to on the airplane. 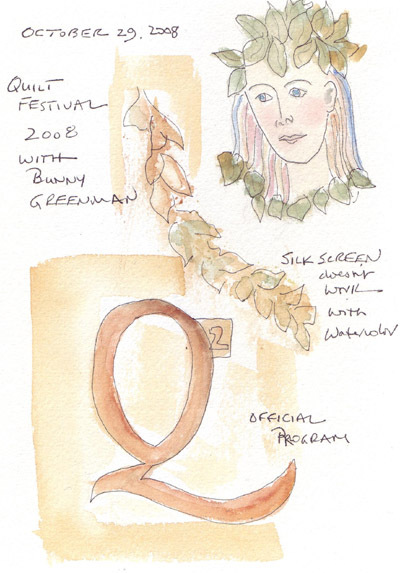 Festival opened at 5PM and on Wednesday evening I sketched a face inspired by one of the award-winning art quilts, tried to use a teeny silk screen for watercolor, and sketched the logo for the huge program of events. 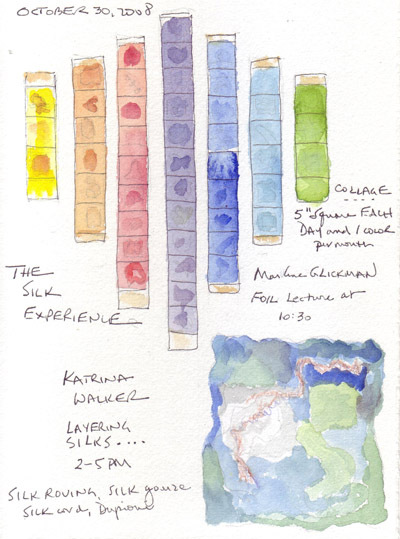 On Thursday afternoon I took a class that was part of the Silk Experience series and painted a beautiful series of silk color squares that were in the room and the piece of layered silk that I learned how to felt using a manual felting tool. Hand dyed silk roving is gorgeous and I now need to decide how to use some of it in my projects at home. The painted square at the bottom right is made of layers of silk roving, silk gauze, silk Dupioni, and silk cord - all felted to a piece of silk batting. I may need to add small beads to it and make a decorative pillow. On Friday I took two classes - Stitch-resist Shibori on silk in the morning and Stamps, Stencils, and Embossing (on velvet) in the evening. 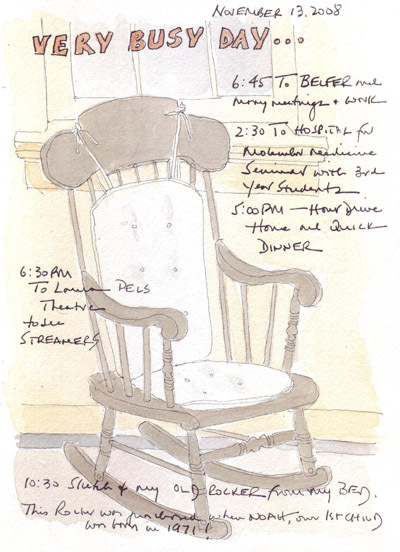 The top sketch is a poor-likeness of my teacher drawing the stitching pattern for our first piece of shibori. The bottom sketch is the pattern I made for my silk-screen and stencil work. 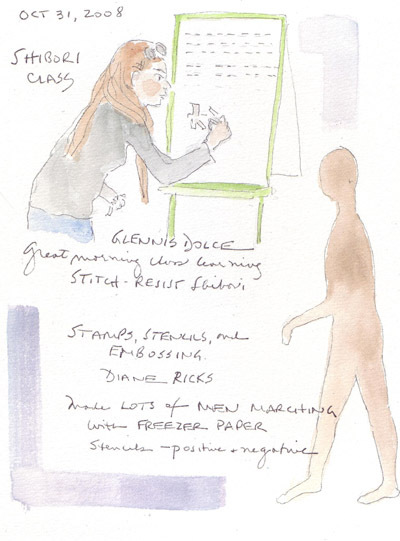 On Saturday I attended a morning session where 20 mixed-media artists demonstrated their techniques. 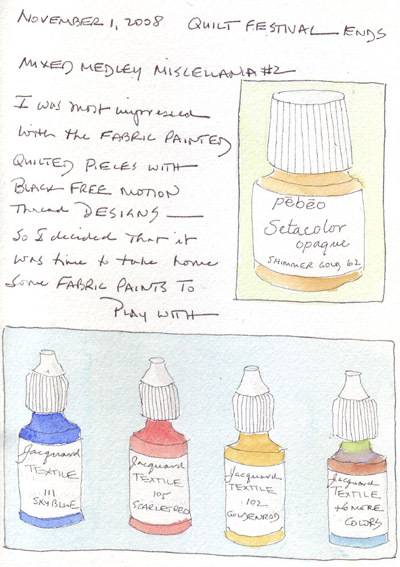 Although I always use procion MX dyes for my surface design on fabric, I was interested in trying fabric paints to convert some of my sketches from paper to fabric. These are just paintings of the bottles of the primary colors and a 4th bottle where I painted the remaining colors, from the set of 8 that I purchased. I also love metallics mixed in and bought an additional jar of antique gold. 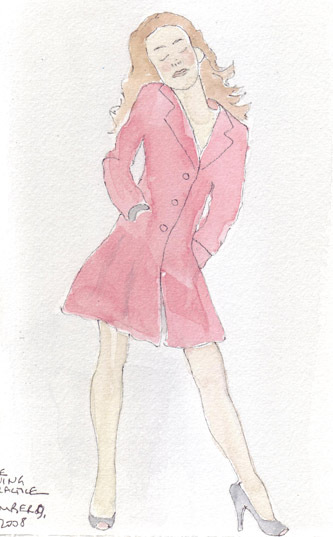 It is good that I will be retiring next year so I will have the time to play creatively on paper and on fabric. Early Sunday AM I flew to San Antonio. my old home in Texas, to attend a medical meeting and I will post those journal pages tomorrow. I just returned from one week in Houston and then San Antonio, Texas. Yesterday as I walked into my building at work, I was overwhelmed with the changes in the trees that occurred while I was gone. Several years ago I collected fall leaves to use as inspiration for a quilted, silk wedding chuppah (canopy) that I made for the wedding of my son. I now find that I just can't pass up a beautifully colored leaf. 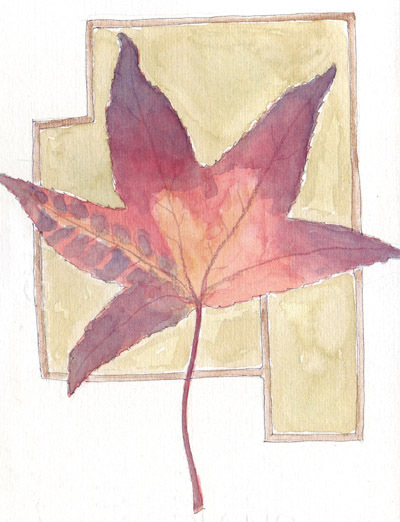 So here is my leaf from yesterday. Nature did a much better job with the brilliant colors than I did! 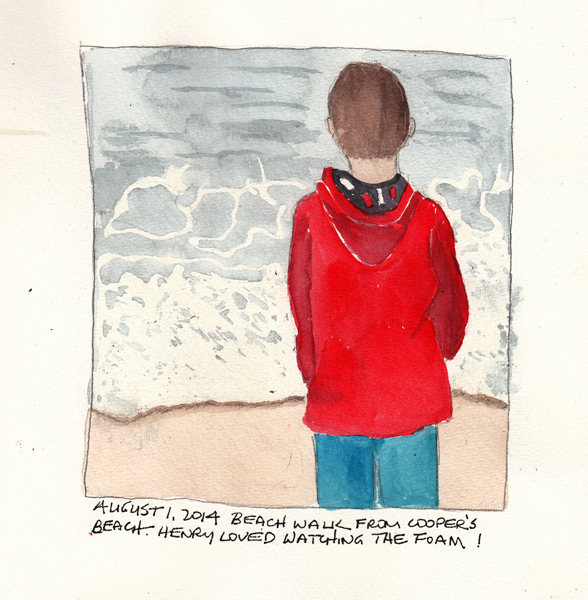 Even though I very busy during my trip, I did do some visual journaling - and hope to post those pages this weekend.